Art interacts with observation and ecology on numerous planes. There is simply the aspect of personal inspiration, as when the creatures I observe in tidepool surveys or just hiking with friends who know the Sonoran desert become the basis for my Linozoic prints. Along these lines, I’m continually amazed at the diversity and quality of artwork produced by ecologists, samples of which I find myself auctioning off each year at a student benefit auction at the Western Society of Naturalists meeting. I’ve often wondered if there is an unusually high percentage of artists among ecologists, or if, say, I had the chance to run a raucous auction at the Western Society of Certified Public Accountants (if there is such a group) that all those bean counters would bring forth amazing pieces of work inspired by, inspired by…um…spreadsheets? Lacking any data on this topic, let’s just say that given the much richer source of inspiration for ecologists than accountants or Wall Street bankers or dentists (although I recall in my home town of Woodbridge, CT that a dentist took a sculpting class and made, what else, a giant tooth, which he placed in front of his dental offices, until the town selectmen told him he had to take it down because it violated the sign ordinance), it might be so, that there is a high percentage of artists among ecologists. Certainly, artistic skills play a more practical role in scientific ecology than they might in preparing tax returns. The ability to draw simple but demonstrative sketches in field notebooks continues to be necessary, even in a world of smart phones and cameras. 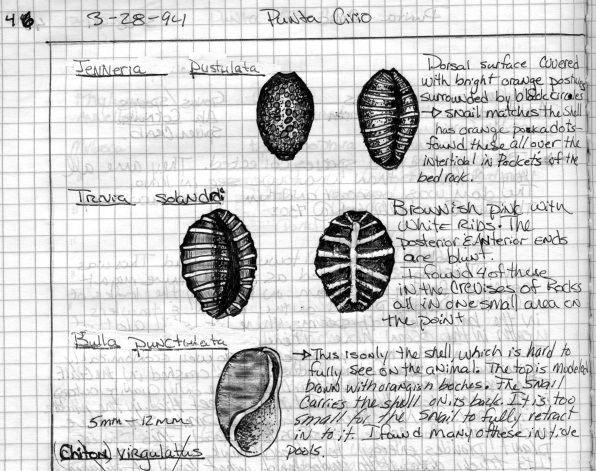 In our book Observation and Ecology, Kirsten Rowell and Anne Salomon share some of their truly artistic field journals and explain how not just the drawings, but the act of drawing, helps them retain memories of a place or species and also to contextualize it ecologically. For a grander examination of this topic, Michael Canfield’s Field Notes on Science and Nature (2011, Harvard University Press) is a gorgeous collection of essays and full color reprints of ecologists’ field notebooks that expresses the full range of field art, from utilitarian to near masterworks. Art is also a source of data in observation-based science. I think of a highly textural Ansel Adams photograph from the 1960’s, close up on some rocks at Point Lobos State Park in California. Most visitors to this gorgeous rocky peninsula south of Monterey Bay see a pristine landscape, assuming this is what California looked before the arrival of humans. But the Adams photograph, as well as a wonderful lecture given by local historian Sandy Lydon called ”The Unnatural History of Point Lobos” (which I heard back in 1994 at Hopkins Marine Station) belies another picture altogether. In the photograph, the natural contours of the rocks are contrasted by a set of perfectly round holes bored into them. As Lydon’s lecture suggests, the holes in the rocks were likely bores for sticks of dynamite, used in the granite quarry once operating at Pt. Lobos. And not only was this “pristine” spot once an industrial pit, but it was also a whaling station, where the bodies of Pacific leviathans hang and bled and stank as they were flensed and rendered. Art-based data are also at work in reconstructing the ecological history of a decidedly less pristine environment, the Mediterranean Sea. There, ecologist Fiorenza Micheli and her collaborator Paolo Guidetti poured through pictures of ancient Greek and Roman mosaics to find evidence of ecological change. Specifically, they looked for depictions of dusky groupers in mosaics from the first through fifth centuries. Where now the Med is populated sparsely by smallish groupers that live in deep waters, what Micheli and Guidetti found in the mosaics were images of very large groupers, very close to the surface of the water, being taken by dip nets and harpoons. The sizes of these fish in the artworks might not be enough to draw many conclusions—it is just as likely that ancient Greeks and Romans told fishing stories about the size of their catches, just as with today’s anglers. But the type fishing gear and the proximity to the surface are additional clues strongly suggestive of the existence of very large and very abundant groupers in the Mediterranean hundreds of years ago. Finally, there seems to be a growing community of citizens and scholars interested in connecting art and science. As one example, poet Eric Magrane has developed the Proximities blog at the Institute of the Environment here at University of Arizona. In his first post he interviews artist Paul Mirocha, now “artist in residence” at Tumamoc Hill in south Tucson. Mirocha himself is an important connector between art and science, having illustrated books for two other important southwest connectors—Barbara Kingsolver and Gary Paul Nabhan (who also contributed a great piece on natural history observation to our book). But the site where he is in residence, Tumamoc, is also notable for its long history of bringing a broad swathe of the Tucson community in direct connection with the desert environment and with a working scientific reserve. Although Mirocha is a fabulous hand illustrator, one of his latest projects is an amazing merge of an artists/naturalists eye and very high technology. Working with the UA space imaging labs that have been sending home otherworldly panoramas from Mars, Mirocha has produced panoramas from Tumamoc Hill with his “Giga Pan” that provides incredibly high resolution panoramic and close up. You can take in the breathtaking view of downtown Tucson and the distant Catalina Mountains from Tumamoc, then zoom in to a perfectly focused image of a pictograph hammered into the rocks by the Hill’s early human inhabitants. As we discuss in Observation and Ecology, intense observation and high technology are an emerging new symbiosis that is transforming science. These scientific artists and artistic scientists are showing how beautiful and powerful this transformation can be.